Rin Tin Tin: A Silent Film Star On Four Legs The orphaned German shepherd was found in the wreckage of a kennel during World War I. Writer Susan Orlean details how he became one of the biggest film stars of the silent era in Rin Tin Tin: The Life and Legend. By the 1950s, Rin Tin Tin was played by three dogs, who often traveled around the country making public appearances. 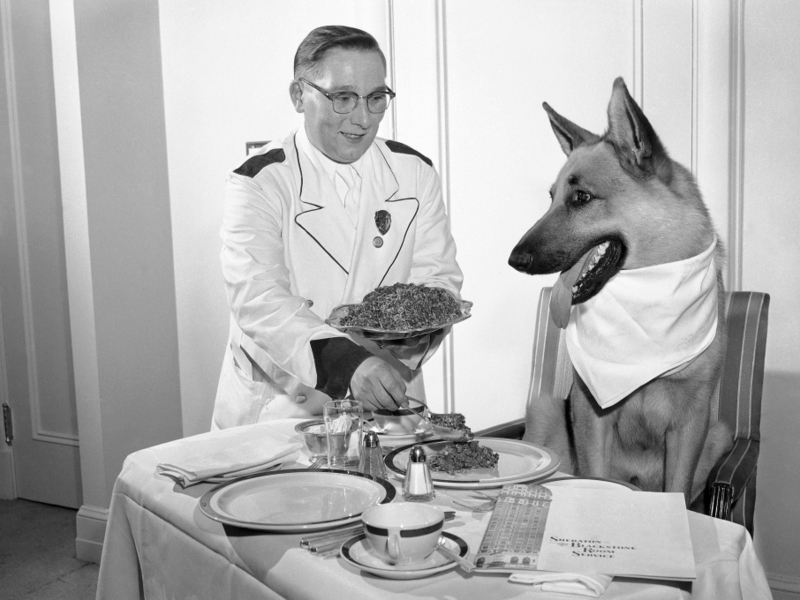 In this undated photo, one Rin Tin Tin enjoys a luxury dinner in his Chicago hotel suite. Members of the baby boomer generation might remember the old TV series The Adventures of Rin Tin Tin, about a German shepherd and a boy named Rusty who lived with a cavalry troop in the American West. In 1954, Rin Tin Tin was even "interviewed" by a writer for The New Yorker who noted that he turned up his nose at roast beef and drank milk from a champagne glass. But the 1950s version of Rin Tin Tin wasn't an original. The German shepherd on TV was a reincarnation of an even bigger celebrity dog who had dominated the silent screen in the 1920s, almost won an Oscar for Best Actor and nearly saved Warner Bros. from financial ruin. In silent films, people and dogs were on par. 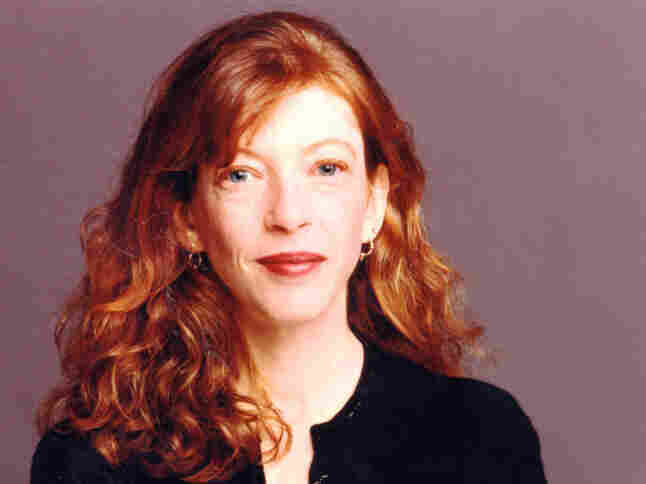 "Warner Bros. was a small studio when they began making Rin Tin Tin films," says New Yorker writer Susan Orlean. "Not only did he make them a major studio, but whenever they found themselves in any sort of financial straits, they would release a Rin Tin Tin film and it would set things straight. He was known around the Warner Bros. lot as the 'mortgage-lifter.' 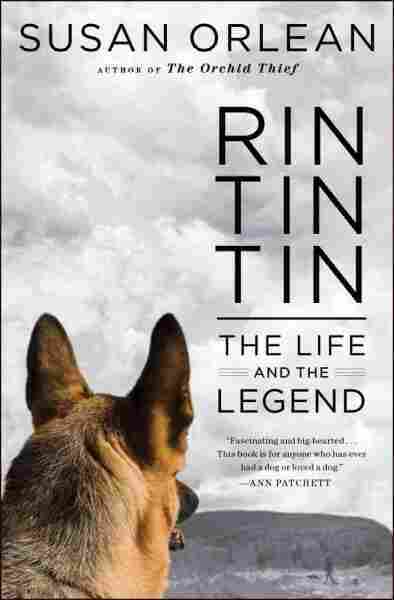 "
Orlean details Rin Tin Tin's journey from orphaned dog left on a World War I battlefield to international icon and movie star in her new book, Rin Tin Tin: The Life and the Legend. "He was in these films with the big silent film actors of the time, and yet his was the name that was above the title," she tells Fresh Air's Dave Davies. "He was the big draw. ... Rin Tin Tin was the leading man." Part of the reason for Rin Tin Tin's success, Orlean says, was the fact that he rose to prominence during the silent film era. "In silent films, people and dogs were on par," she says. "No one had the power of speech. ... Moreover, dogs look much more natural not talking than people do. When you see some of these films, there's a quality that's a bit ridiculous because we know people can talk. ... Dogs are just doing what they do naturally. And they never look diminished the way people sometimes can. They were perfect silent heroes." When the silent film era ended, Warner Bros. terminated their contract with Rin Tin Tin's owner, Lee Duncan. "They wrote him a letter, saying they were putting all of their energy as a company into this medium of talking pictures, and everyone knows, as they said in the letter, that dogs don't talk," she says. "As soon as people began hearing speech in film, they were fascinated by it. ... The fact that dogs didn't speak made them seem much less interesting in a movie when people were so fascinated by the new capacity to hear sound." Rin Tin Tin was relegated to B movies for the rest of his life. In 1932, he died — and every newspaper in the country carried his obituary. "It was on a scale that is hard for us to imagine now," she says. "Radio programming ... was interrupted around the country with a news bulletin announcing his death. [Obituaries appeared] extolling his virtues and talking about the loss of Rin Tin Tin as a tragedy, as an irreplaceable figure in American and international culture." 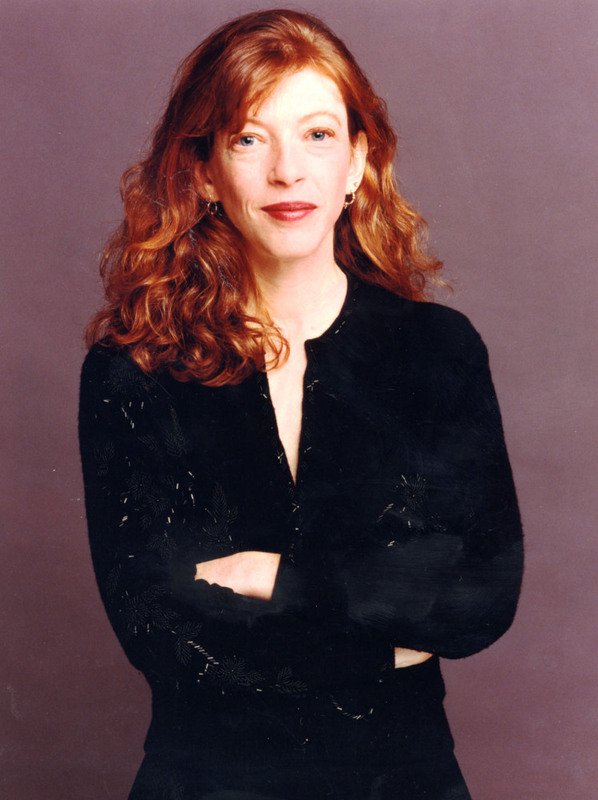 Susan Orlean is a staff writer for the New Yorker and has contributed articles to Vogue, Rolling Stone and Esquire. She is the author of several books, including The Orchid Thief. "The story was that [Rin Tin Tin] was in line to get the first Best Actor award. It was the first year the Oscars were being given out. It wouldn't have been unheard of. He was a huge box-office star. It wasn't a crazy idea. He was that popular and he was that seriously regarded as an actor. But the academy, according to the story, believed that this new idea of handing out these Oscars could possibly be damaged by the first Best Actor being a dog even though everyone loved Rin Tin Tin." "They laid communication wire. They carried communication messages. They worked as cadaver dogs. After a battle had ended, dogs that were trained for this purpose were released onto a battlefield to quickly identify to the medics which of the bodies still had life in them. They were many times carrying supplies out into a field so that any soldiers who were injured and able to help themselves in some way were able to get the supplies from the dogs — or if they were dying, they could have the companionship of a dog as they were in their last moments." "He was sent to examine battlefields the Germans just left [in France]. When he got to the field, he noticed a building hit by artillery and recognized it was a kennel. He decided to just take a look and see what was left of this kennel. Inside, he found the bodies of a dozen or so dogs that had been killed by the shelling. At the last minute, he heard a whimpering in the back of the kennel. So he made his way through this array of dogs who had been killed and found a female who was alive who had given birth. She had a litter of five puppies. He simply could not walk away. ... He took them back to the barracks and decided to take care of them." "Practically everything you wanted was available in a Rin Tin Tin-branded version. This was the early beginning of merchandising. There was no merchandising before the 1950s. Rin Tin Tin was one of the early big licensers, and kids went crazy." "Rin Tin Tin in the 1920s was a dog who became an actor and appeared in movies, performing roles. In the 1950s, Rin Tin Tin had become an idea. He was a character played by a multitude of dogs. It was generally three dogs who played the part." "I think for me Twitter is the equivalent of working in an office and having those casual conversations that make ... you feel less isolated in the course of writing. Because writing is so solitary — it's such a private enterprise. I first got involved with Twitter when I began writing this book and was spending day after day entirely by myself. I was living out in the country. And here was a way to chat with people and in some cases use them as a cheering squad. I would often post my word count for the day. And people would say, 'Go, you can do it.' And I began to find this relationship with the world of Twitter that I had been missing since I had been working in an office."